Chamber members enjoyed learning more about the summer Geoca-Ching! contest in Evergreen Park and tested their geocaching skills at a workshop on Friday, March 22. Emily Kenny from Multidisciplinary Education for the Environment (ME4E) explained the phenomenon of geocaching over lunch at the Evergreen Park Public Library. Kenny, a librarian at the Oak Lawn Public Library, is a geocaching enthusiast and is partnering with the Chamber to educate members and assist businesses participating in our first geocaching contest this summer. Geocaching is a high-tech game in which players use GPS-enabled devices to hunt for hidden containers, or geocaches, at outdoor locations. Millions of players worldwide have enjoyed geocaching since its inception about 20 years ago. Geocaching is essentially a treasure hunt, and there are more than 3 million geocaches hidden around the world. The Evergreen Park Chamber of Commerce is bringing this fun game to local businesses, as a way to promote them and increase foot traffic to their locations during the summer, when business can be sluggish. From June 3 to August 2 this summer, Geoca-ching! contestants will use their GPS-enabled device and the GPS coordinates of participating business locations to find small containers (called geocaches) hidden somewhere, usually outside. Then they will enter the business and redeem the geocache for coupons, logo merchandise, or special offers—anything you decide! At the end of Kenny’s presentation, she gave Chamber members a clue to a geocache hidden at the library, then invited them to hunt for it. The process took them outside to find a clue, then back indoors to search for a hidden container. Members enjoyed the hunt to see who would be the first person to solve the puzzle and find the geocache. Should you choose to have your business participate, the Chamber will provide you with a waterproof geocache container. 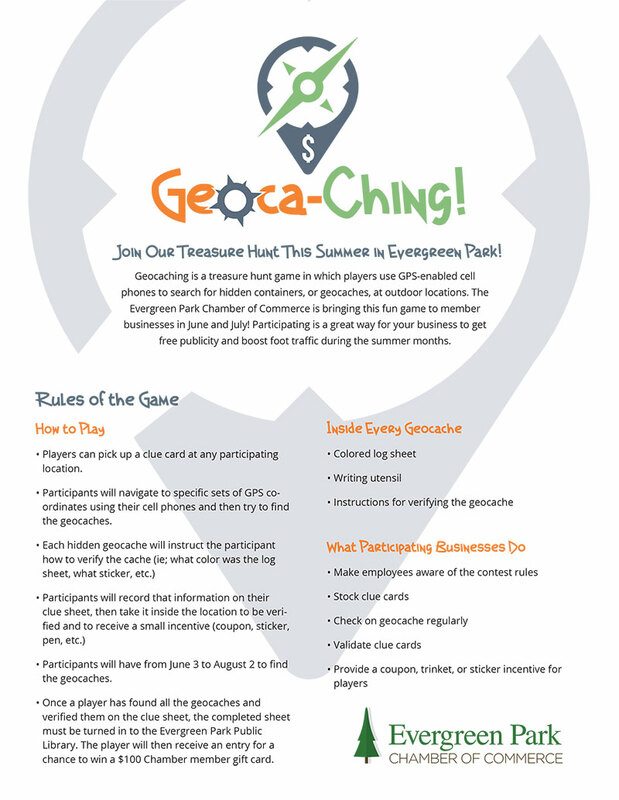 You can collaborate with the Chamber on the contents, which should include a colored log sheet, a writing utensil, and instructions for verifying the geocache. The Chamber, with Kenny’s help, will help you set the coordinates for your geocache once you have found a hiding place for it. Finally, you will need an incentive item, such as a coupon or other giveaway, for contestants who find the geocache. Don’t miss out on this creative opportunity to mix business with pleasure, and bring new customers through your doors! Email the Chamber for more information on becoming a participating business!